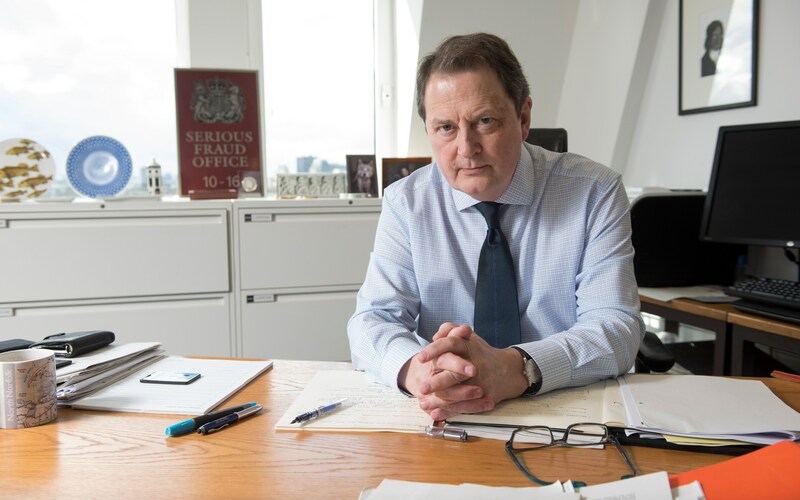 The Serious Fraud Office has been criticised for keeping the details of its new boss under wraps after it announced that a temporary chief will hold the fort for an unknown length of time. The search for a successor to outgoing director David Green has been going on for months, with sources saying SFO general counsel Alun Milford and two external candidates had made the final round of interviews. The Attorney General's office said on Tuesday that a person had now been chosen but is "undertaking the final stages of the appointment process and managing their exit from their current position" and so won't start the role until later this year. In the meantime it said that Mark Thompson, who is currently chief operating officer at the white-collar crime authority, will fill in for Mr Green as interim director once he ends his six-year tenure on April 20. Whitehall insiders had initially tipped prominent barristers Sascha Wass QC and Max Hill QC as key contenders, but sources say neither is the mystery candidate. Although the position is a prestigious one, City legal recruiters said it can be hard to fill due to conflicts of interest and a low salary compared to what lawyers can earn in private practice. Alison Geary, who acts for individuals involved in some of the SFO's investigations, argued that the lack of detail in the Attorney General's announcement "sparks more questions than it answers". She said: "Clearly the permanent candidate is external to the SFO. It is difficult to tell where this new candidate is coming from, why their name cannot be revealed or how long it will be before they are in place. The SFO is, once again, left in limbo." Stephen Parkinson, head of criminal litigation at Kingsley Napley, added that it was "very odd" the SFO still hasn't named a successor. "The decision today suggests that the SFO is heading for a period of torpor and drift. The Attorney General needs to get his act together and make a permanent appointment quickly in my view," he said. Mr Thompson, a former policeman who one ex-colleague describes as "a great guy, very straightforward", will be in the top job for "months rather than weeks," a person close to the process said. He joined the SFO in 2004. He takes the reins at a sensitive time for the agency, which was slammed by a judge earlier this year over its choice of expert witness during the Libor trials and has also come under political pressure. Prime Minister Theresa May had hoped to abolish the SFO and hand its responsibilities over to the National Crime Agency, the anti-drug and human trafficking body set up as “Britain’s FBI” when she was home secretary. Her failure to secure a parliamentary majority at the general election meant plans for the necessary legislation were dropped from the Queen’s Speech. The Attorney General, Jeremy Wright, said he was grateful Mr Thompson had agreed to take on the role. He said: "Economic crime, at all levels, is a growing and changing threat and tackling it is a priority for the Government. The SFO will continue to undertake crucial work to investigate and prosecute some of the most serious and complex economic crime, working closely and collaboratively with other agencies."